What do the following have in common: Chattanooga, Hong Kong, Singapore and (soon) Tallinn (to save you Googling, that’s the capital of Estonia) ? The answer is 10G: the world’s fastest residential broadband services with internet speeds up to 10 Gb/s. Only 18 months ago, our industry was talking about gigabit services as the ultimate frontier. No longer. The thirst for high broadband speeds is greater than anyone could have predicted and 10G deployments are taking off around the world. What’s behind this trend? The main driver is undoubtedly marketing. The vast majority of residential users don’t really need 10 Gb/s, but operators that provide it get a competitive advantage. However, there is a user aspect to it as well. 10 Gb/s downstream services come with a hike in upstream services, and this is where customers are starting to ask for more. The increasing use of cloud storage, immersive communication and video uploads are creating bursts of high upstream traffic. Add human impatience to the equation (when we want the service, it has to be now!) and you end up with a need for symmetrical bandwidth. A residential customer may not need it all the time but when they do, the network must deliver. Time Warner, AT&T, Google, Verizon, Telefonica, Vodafone, Orange, Singtel, NTT and SK Telecom have all launched high-bandwidth upstream offers over the last year or so. Of course, it’s continuing advances in technology that are enabling these speeds. This year saw ITU approval for XGS-PON, a new standard directly inspired by Nokia’s innovation that extends TWDM with fixed-wavelengths. Building on this new technology and our vast experience in fiber, Nokia now has a solution that converges various 10G technologies onto one platform, giving fiber operators an opportunity to choose the right 10G service at the right cost: symmetrical or asymmetrical, tunable or fixed optics. 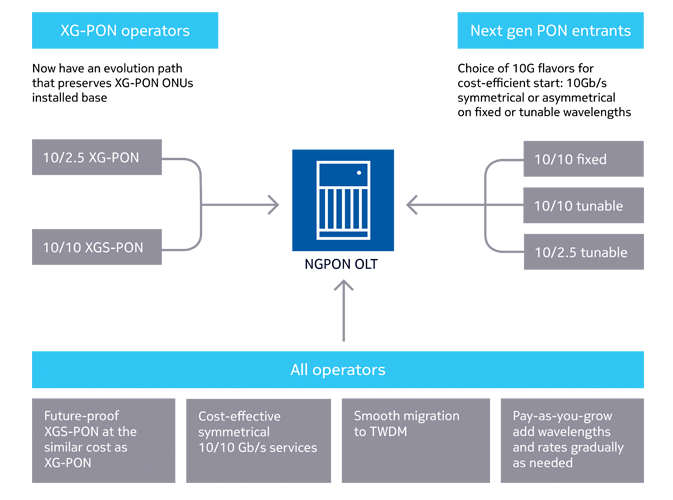 They can start with a cost-effective solution for 10G services and have a future-proof upgrade path to TWDM-PON. t’s the potential for symmetrical bandwidth that makes XGS-PON and TWDM-PON extremely attractive for operators. This capacity enables a host of new revenue opportunities and operational advantages. The most immediate is mobile backhaul. 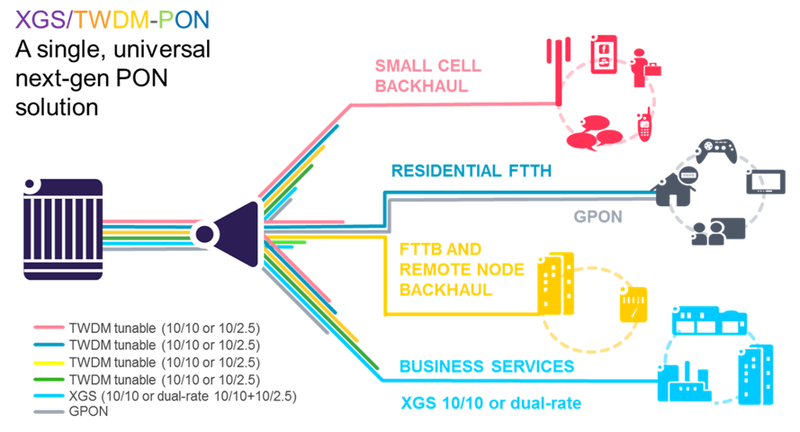 As the FTTH network is being deployed for residential customers, using its extended capacity to also backhaul small cell traffic eliminates the need for two separate networks. This is exactly what Shaanxi Mobile is doing with XGS-PON in China. Another opportunity is business services. Moving from a 1G to 10G fixed access network lets operators expand their addressable market from home office/small office customers to high ARPU enterprise services. At the FTTH Council Americas conference in June 2016, Guy McCormick, VP of technology engineering for Cox Communications, mentioned in his keynote speech that Nielsen’s law, which forecasts commercial broadband speeds, has served us well for the last 20 years. But the recent market trends go above the Nielsen line. McCormick questioned whether this is one time offset or the beginning of a new trend. That remains to be seen. Ana heads the Fixed Networks Fiber marketing activities in Nokia. She built up extensive international telecom experience, with positions in sales, pre-sales and R&D in Germany, Spain, Portugal, Belgium and India. Ana has a Masters Degree in Informatics and Computer Science from the University of Belgrade. As member of the Board of Directors of the FTTH Council Europe, she’s a strong advocate of Fiber.